California Rubber: What advice do you have for a young hockey player and his/her parents? Soren Jonzzon: My advice for young players is to have fun. If you aren’t having fun and aren’t passionate about hockey, then you aren’t going to enjoy the work that you have to put into it. It’ll take a lot of work to be great and play at a high level, but keep working on your weaknesses and always have fun. CR: What is your game-day routine? SJ: My game-day routine is to wake up and have breakfast. Then I go to the rink and we have morning skate. I go home and eat some pasta. Around 2 p.m., I take a nap until 3:30. Then I go to our pre-game meal. From there, I go straight to the rink and get ready for the game by taping my stick and stretching and doing a dynamic warmup. Then I get dressed for the game. CR: What is your favorite sport outside hockey and why? SJ: My favorite sport is baseball. I love playing catcher and being involved in every play. It has even transitioned into me playing in adult league fast pitch softball leagues in the summer. I love it because I have met so many people and made so many new friends. 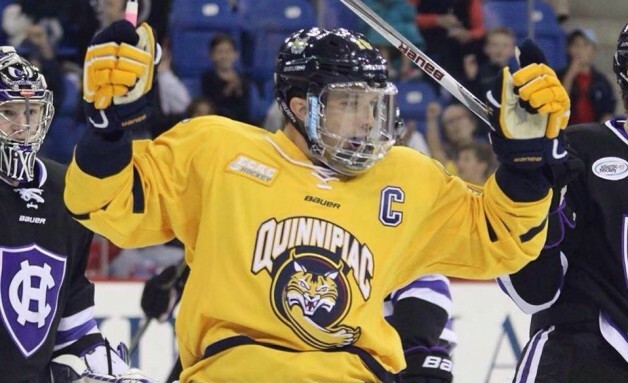 CR: What was your favorite or best hockey moment before playing at Quinnipiac? SJ: My favorite hockey moment before coming to Quinnipiac was winning a national championship with the St. Louis Bandits of the NAHL. We were such a good team and the guys on the team were fantastic. I had so much fun and learned so much. CR: What is the most challenging aspect of being a student-athlete? SJ: The most challenging aspect of being a student-athlete is missing class and how much time you commit to the team. You have to learn all the material on your own and make sure that you have all your work done even though you have long road trips and weekends away from the school. CR: If you weren’t playing hockey, what would you be doing? SJ: I would probably be very active with lots of interest groups at school. It’s fun to get involved with different groups and organizations on campus. CR: What is your favorite vacation spot and why? SJ: Sweden. I have been lucky enough to go back and visit family there. It’s so much fun to see my relatives and get to learn about the differences in culture there. CR: Who was the player you most idolized growing up and why? SJ: Owen Nolan. He was the captain of the San Jose Sharks and he was a skilled guy, but he wasn’t afraid to be physical and make sure that he stuck up for his teammates. CR: What’s the one thing people should know about you? SJ: I am a huge fan of SpongeBob SquarePants, and I wear it proudly.